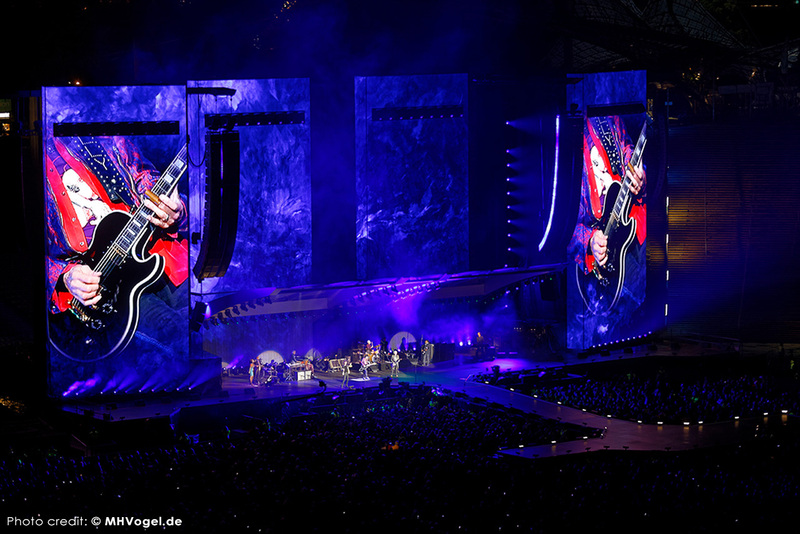 Paris’s newest arena space, the U Arena, threw open its doors in spectacular fashion this autumn when The Rolling Stones performed the final three European dates of their No Filter tour to sold-out audiences of 40,000 people each night. As an inaugural event, it doesn’t get much bigger, and Robert Juliat was proud to be part of it - in its home city - with eight RJ Lancelot 4K followspots playing a key role in the action on stage. U Arena is now France’s largest indoor arena, and one of the biggest in Europe, and a prime host for the Stufish-designed set comprising four massive video walls over-reaching a part-canopied, 60-70m wide stage and 14m thrust which only just succeeded in containing the exuberant performances from these eternal legends of rock. The Rolling Stones like their followspots to deliver a big rock and roll look with beams passing across the auditorium to draw the audience’s focus directly onto the artists. “This is a very important function on some of the larger shows,” says Fraggle. “The audience come to look at the band, but an LD often wants to make a statement with the rest of the lighting that doesn't necessarily involve lighting the band. As technology advances, there are new ways of achieving this and having a 4000W followspot pointing directly at the artist from out front is a very strong, dynamic look. 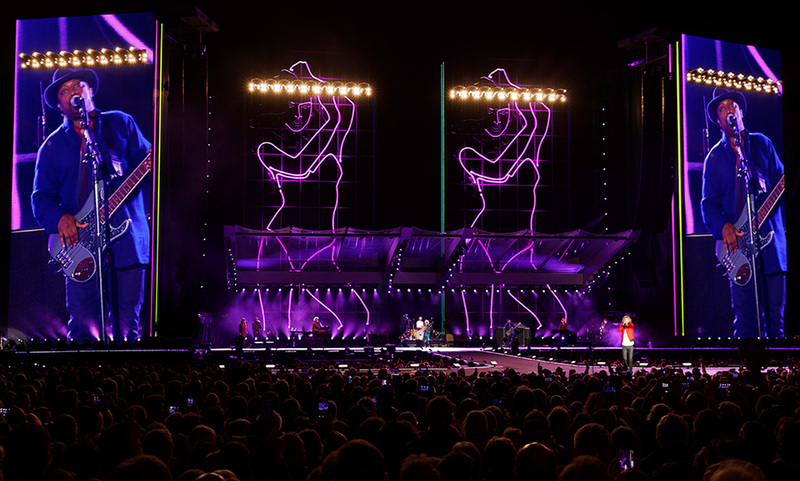 The Lancelot followspots were rigged on two front-of-house towers located mid-field beside the lighting and sound pits, from where a pair of each were trained on Jagger, Richards and Wood, with the final pair lighting the bass player, Darryl Jones, and acting as a spare when guests were not on stage. The highest followspot position was occupied by veteran followspot operator, Barry Branford, who reprised his long-term role as Jagger’s chosen followspot operator, having worked with the band for over 20 years. This topmost position is reserved for Jagger’s followspot as it gives the best angle and shadows to show the energetic and highly mobile lead singer to best advantage, on stage and screen. This was mirrored on the opposite tower where the top position is the reserve of Richards’ spot, with each artist also having a second spot at no 2 position on the opposing side. Branford has used many followspots in his long career: “Lancelot is the easiest spot of its size to use in these kind of situations,” he confirms. Woodroffe and Cook’s design emphasised the hard edge beams and shadows of the followspots and, in keeping with the minimal colour palette, used just a couple of colour correction filters and a new colour, Marlene, (rose blush) to add warm tones to the artists’ skin colours. 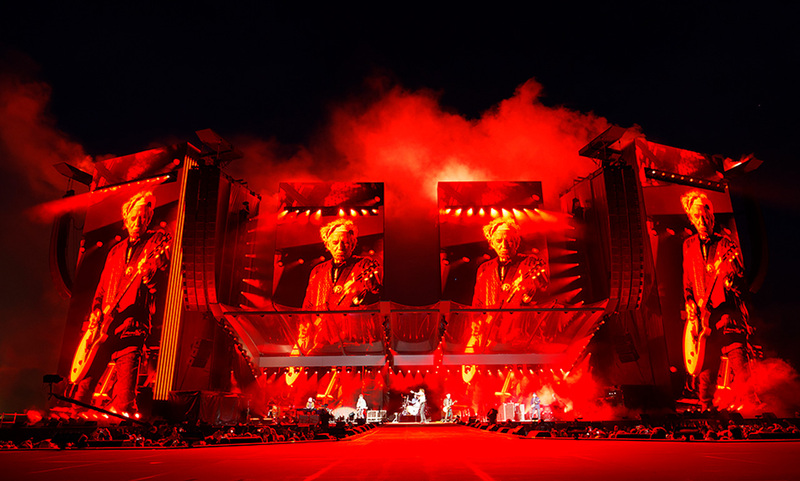 “Good, consistent spotlights are key to lighting a Rolling Stones show,” says the tour’s lighting director, Ethan Weber. “Our goal is to make sure that all band members - principals and back-ups - are lit well enough that the audience can watch whomever they want at anytime during the show. I think, largely due to the Lancelots, that we’ve achieved that. “I’ve always been very happy with the quality of light that comes out of Robert Juliat spots. I also appreciate very much the clever fader that makes ins and outs much smoother; and the fact that the bulbs don’t need to be removed for travel. It saves a good hour or so a night not having to tweak them. WBD also looked after the visual video integration for the No Filter tour: a d3 media server system was put in place to playback content, produced by Sam Pattinson and Treatment, format IMAG feeds coming from video director, Nick Keiser, and to give the band some extra love with effects and tints. Roland Greil from WBD, in the role of screens director and d3 programmer, was responsible for keeping the balance between all visual elements, which is key in such a show as this, to ensure a fitting visual look between the elements of lighting and video is maintained. The RJ Lancelot fixtures were supplied as part of the total lighting inventory by UK-based Neg Earth Lights which uses Robert Juliat followspots exclusively on most of the tours it supplies. The job of rigging and setting up the Lancelots at each venue fell to the tour’s followspot technician, Dan Wiseman. Wiseman is a great advocate of Robert Juliat and was very happy to join Fraggle on a tour of the Robert Juliat factory before the final show.